In the weeks this web site was started, in August 2003, the town of Kleinschmalkalden celebrated its 625th anniversary. As far as we know now, the Giegengack family stems from this charming little town in the hills of the beautiful Thüringerwald (Thuringia), the green heart of Germany. 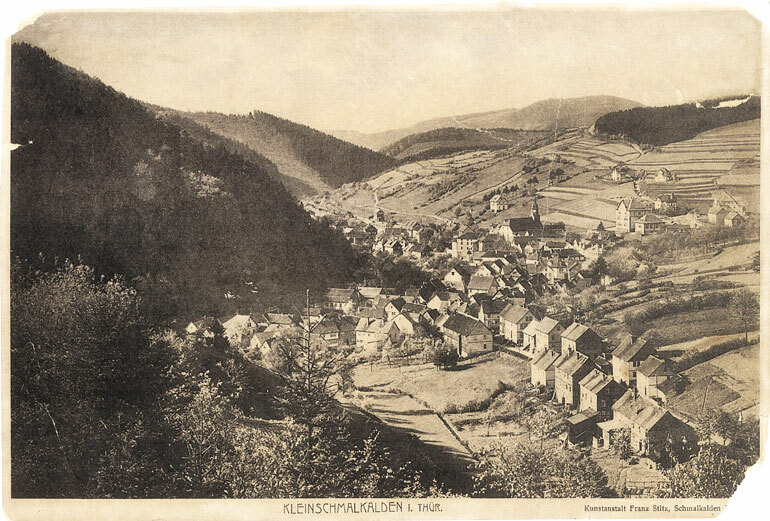 This beautiful postcard of Kleinschmalkalden was sent by Linda Bray (USA). It was her grandmother's, "so it's at least as old as the 1920's", Linda writes. Text on the card: Kleinschmalkalden i. Thür. (in Thuringia), Kunstanstalt Franz Stitz, Schmalkalden ... .
For more then 470 years the history of the Giegengack family is linked to Kleinschmalkalden. From here our adventurous ancestors found there way to countries like Denmark, the Netherlands, the United States of America, Australia etc. At this page we will have a closer look on the history of our family members in Thüringen and abroad. The history of Thuringia dates back to the prehistory. Many evidence of Stone Age people is found in the area. The oldest finds date back to 350.000 before Christ. In the first millennium BC Celts entered the territory now known as Germany and pushed away the hunters and cowherds that lived there. They settled in large parts of the present Germany, including Thuringia. From those times the first sanctuaries in Thuringia date. Scandinavian Germanic tribes gradually migrated from the north and drove away the Celts or mixed with them. From the beginning of the Christian era the Romans tried to conquer the Germanic tribes but only a small portion of southwestern Germany came under their control. After the fall of the Thuringian kingdom (531) Franks, Saxons and Swabes immigrated in the area. The Thuringian tribe remained largely as it was but their territory was reduced to the Harz mountains and the Thuringian Forest region and was governed by Frankish dukes (Merovingian dynasty). From the sixth century Slavs, mainly Sorbs, settled down in the deserted area between Elbe-Saale and the Oder rivers. Occasionally they penetrated in the east of Thuringia to beyond the Saale. Due to rivalry amongst themselves the Slavish tribes didn’t manage to built a lasting administration. Since the conversion of their king Clovis (496) the Franks gradually embraced Christianity. The initially merely loose connection of the Thuringians to the Frankish realm became gradually firmer. After the conversion of the Thuringians to Christianity (particularly lead by St Boniface, who founded a bishopric at Erfurt in 742) Thuringia was the starting point of the Christianizing up to the Saale and Elbe rivers. In 751 the Carolingians took power from the Merovingians. About 800 Charles the Great (Charlemagne) subjected the Saxons and made Thuringia a march (frontier country) against the Slavs. In 843 the Frankish empire was divided in three kingdoms in the Treaty of Verdun: West, Middle and Eastern Francia. Eastern Francia, including Thuringia, came under rule of Louis the German. A small stem duchy emerged from the fragmentation of the Frankish Empire. The name Gi(e)gengack first appears in Thuringia in the records of conscript soldiers in 1543. We can savely say that our family lived in Kleinschmalkalden and Thüringen since the late Middle Ages and possibly longer. Members of the Giegengack family lived in Denmark for a period of almost a hundred years. 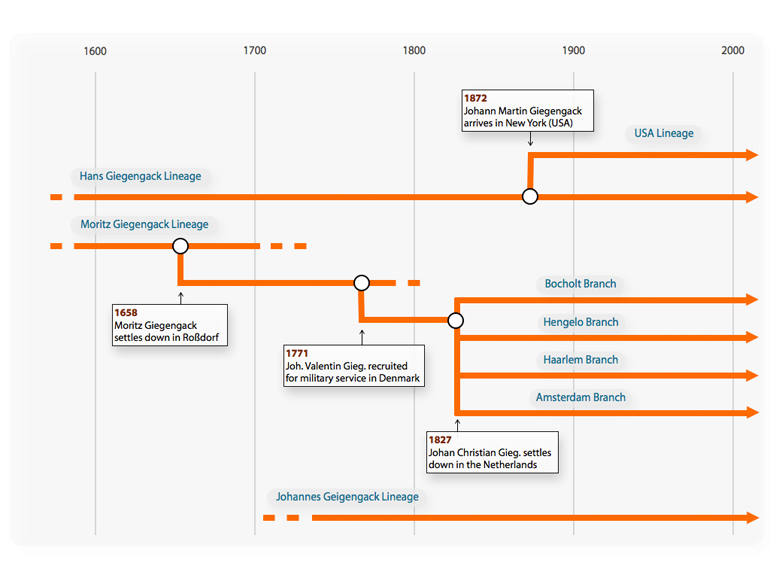 Both Valentin Giegengack and Johannes (or Jochum) Giegengack came from Sachsen-Meiningen (Thüringen) and moved to Denmark, where they started families who's members lived in Denmark between about 1771 and 1868. We try to give a small overview of this episode of the family history. Johann Valentin Giegengack, a tailor (like his father) and coming from Roßdorf, Thüringen, was a soldier in the German city of Zerbst (close to Magdeburg, Sachsen-Anhalt). In 1771 he was in Oldenburg (Northern Germany but from 1667 to 1773 under Danish government) recruited by a certain sergeant Pedersen for military service in Denmark. He became a Sergeant in the 'Norske Livregiment'. We think that he went to Denmark in that same year but the first proof of his stay in Denmark is from a church book which mentions his marriage nine years later, on 7 January 1780 in København (Copenhagen) to Marie Eleonora BISER. They had six children. One of their children: Johan Christian Giegengack, is the forefather of all the Dutch branches and the Bocholt branch. Valentin Giegengack died in Copenhagen in the Fredriks Hospital on 4 February 1798. Johan Christian left Denmark between 1826 and 1828 and settled down in the Netherlands. Also Johannes Giegengack came from Sachsen-Meiningen (Thüringen), more specific from the town of Rossdorf (see the Moritz Giegengack Lineage). He and his children lived at the Danish island Lolland in the places Nakskov, Sandby, Maribo and Vaabensted. His son Henrik Kristian became a tambour (drummer) in the 'Falsterske Infanterie-Regiment' in Aalborg (the main city in the Northern Denmark). The youngest son went to Vordingborg (Südseeland) where he worked as a dyer [Färber]. Than there is a third Gigengack, also on Lolland: Jorgen Gigengack. We have no information about his parents so far. But it seems reasonable that Jorgen Gigengack is a son of Valentin or Johannes Giegengack. All three Giegengacks mentioned here have kids, and some of the daughters married to Danish men. Thanks to an e-mail that we received on Jan. 6th 2004 from Johnny Johansen from Nakskov, Denmark, a descendant of Jorgen Gigengack, we know that there still are descendants in Denmark nowadays! Johan Christian Giegengack, the son of Valentin Giegengack, left Denmark in about 1826 or 1827 and went to the Netherlands. Again the economical situation could be the reason for his move. Probably because he married a catholic woman (Maria Wilhelmina MENTING), all Dutch and Bocholt-Gigengacks - as far as we know - became Roman Catholic in stead of Protestant. Johan Christian was a musician/pedlar [Spielmann - speelman, muzikant, marskramer]. He settled down in Aalten in the Netherlands close to the German border, and later went to Zutphen (also the Netherlands). His descendants moved to Bocholt, Hengelo, Haarlem and Amsterdam where family members still live nowadays. In 1868 Mare Kirstine Gigengack died in Hellenes, Branderslev, Maribo, and although that brought an end to the Giegengack-dynasty in the Danish region, her descendants still live in Denmark. The Gigengack carousel in Hengelo. Year unknown. Photo Fikkert Hengelo. 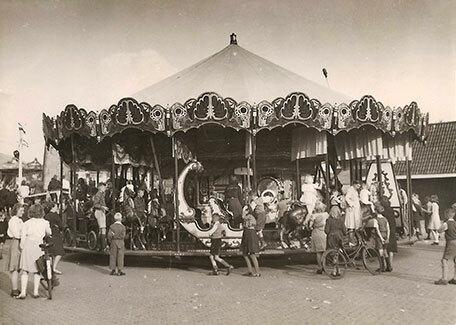 About 25 years after his parents had settled down in the Netherlands around 1826, Fredrich Ferdinand Gigengack bought a small carousel in the Dutch town of Aalten, with which he traveled to festivals and fairs. His father Johan Christian already worked as a musician and pedlar, so the family was experienced in the art of traveling and amusing people. In 1895 Johannes Ferdinand and his wife Johanna Maria TELDERS built a carousel that is still owned by the Gigengack family. The mill passed to their son Francis Anicetus (born in Zutphen in 1888). 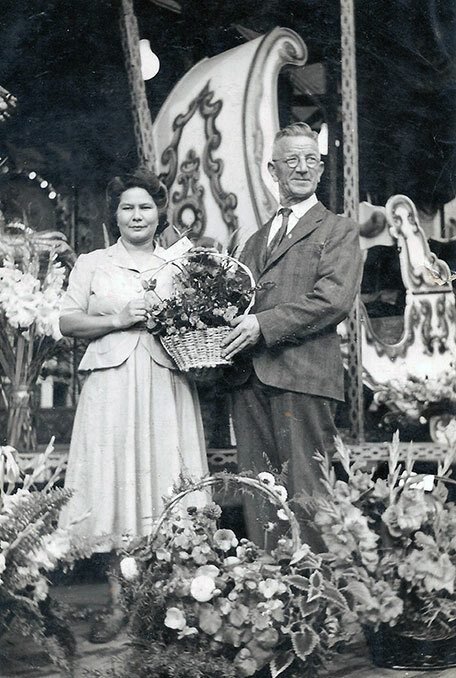 Frans and Mien Gigengack are being honoured for the fact that the Gigengack family did visit the town of Wijhe with the carousel for the 75th year. 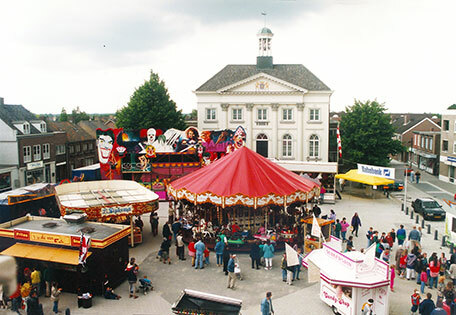 The Gigengack carousel in the town of Zundert (the Netherlands). Year unknown. On September 5, 1974 the Gigengack family with their merry-go-round for the hundredth time visited the village of Wijhe, and this time they brought with them a bronze sculpture of the mill, made by sculptor Jan Kip, which was presented to the city council. The late Johan Gigengack wrote in the Twente Post in 1974: "Standing on the floor of the carousel, which was built traditionally on the church square, the mayor in his official address pointed to the 100-year bond between the town of Wijhe and the Gigengack family from Hengelo". In 1964 oldest son Tonnie Gigengack took over the carousel and continued the work of his ancestors till 2012. Tonnie died in August 2016 and till then no successor found in the family to continue travelling with this carousel. Samuel Dellit (Australia) is working on a summary of the political and administrative divisions applicable to Kleinschmalkalden.